Delicate Flower or Triffid ? Here is an image of the 4th stellation of the icoshedron that I finished yesterday. 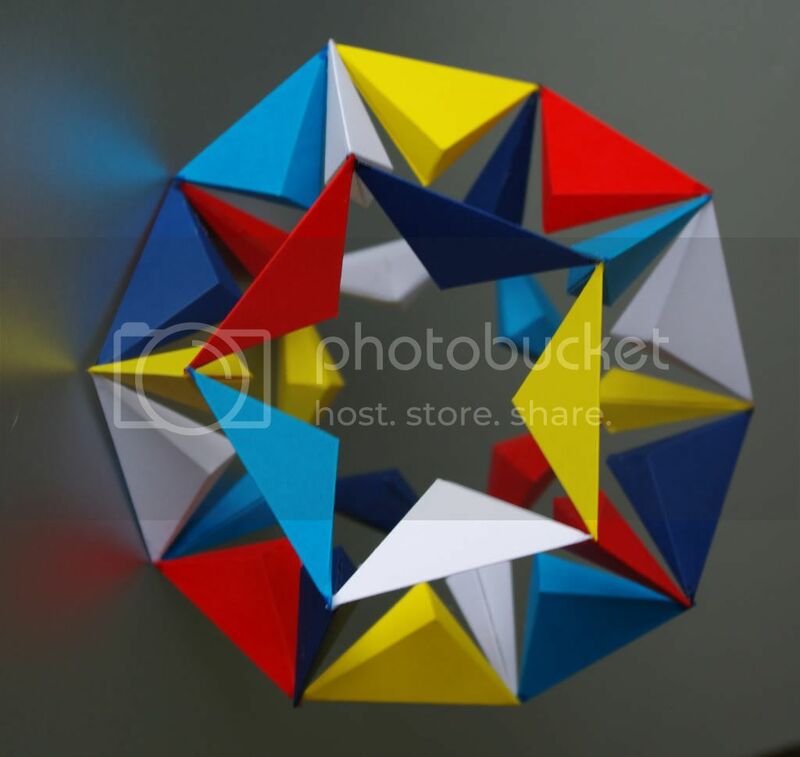 It looks pretty simple - after all it is only a stick model of the docecahedron - but it is a realy **** to put together. The difficulty stems from the fact that the wedges that comprise the sides are only joined at their vertices, so there are no tabs and no means of support other than the glue. The vertices are also very sharp, so there isn't much surface area at the join. This is my 2nd attempt at this one; I jumped up and down on the first after about two weeks. I also went through seven cradles in the process ! I'll provide the construction details, if anyone is interested. Yeah, I'd be interested to hear what you did. Some day I'll make a vertex-only connected model, but haven't tried it so far. 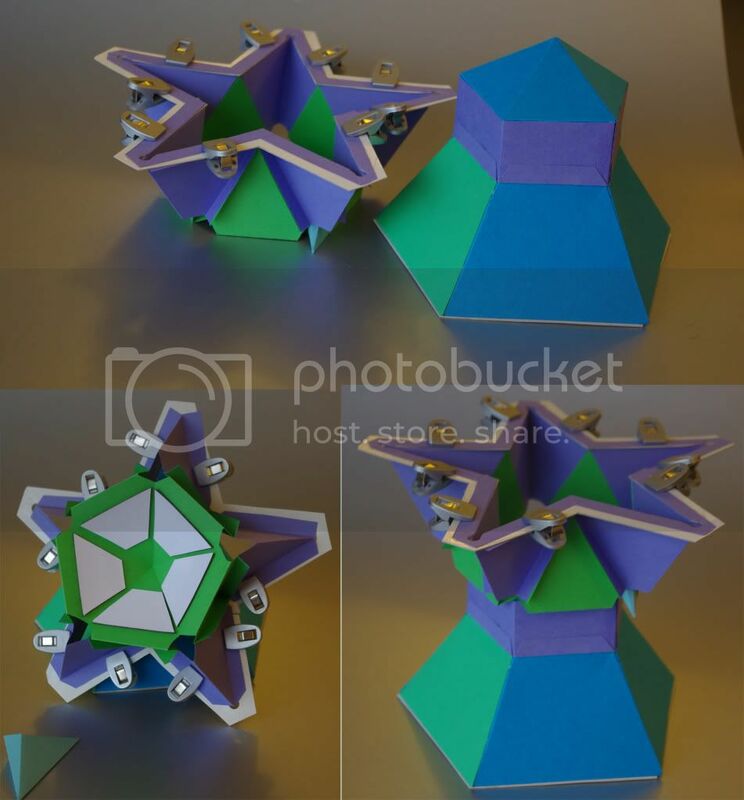 Did you follow Wenninger's instructions from Polyhedron Models maybe? I think if I ever attempt one, I may thread fishing line or other thread through the connected vertices, which should keep things lined up, although obviously glue also required to solidify the joint in place. I started off using the method suggested by MW, i.e using half a deltahedron as a construction cradle. In fact I tried three versions of the deltahedron, each more carefully constructed than the its predecessor. I found it difficult to access the cells to apply the glue and they moved about very easily. The cells really need to be firmly held and precisely positioned – half a millimetre out is no good. Eventually, I settled upon a cut-down half-deltahedron as my cradle (see image). It is easier to access the cells with this design. This cradle is not rigid, so it opens out into a (rather pretty) bowl. I clamped a pentagram to the lip of the bowl to keep it rigid when the cells were being assembled. Afterwards, I was able to remove the clamps and rotate the shape (as described by MW), then re-clamp it. As the model grew, I had to cut the pentagram into three pieces to release the bowl. As it was quite rigid, it could still hold the bowl in the correct shape when the clamps were in place. To hold the cells in place, I used two techniques: magnetic clamps and blu-tac. If you look at the underside of the bowl, you can see that I have glued ferrous strips there. I used little bar magnets which I already had (see http://first4magnets.co.uk/ ) to secure the cells in place; this worked really well. Blu-tac works pretty well too – around the obtuse vertex of the cell. To make it easier to access the cells, I built a little tower. The picture shows how the cradle sits on top of it. The next requirement was rather special glue. I found that UHU gel just wasn’t strong enough, so I got some “SLO-ZAP” superglue. This did the trick, but is poorly documented. It comes in several “flavours”; I used the yellow “thick” one, which is actually quite thin. If you use this, only use a tiny bead on each vertex; if you use too much it will not set (at least not for a very long time). Also, it is drawn into the card by capillary action, so if you use too much, it will stick to the cradle! Make those holes in the cradle big enough. If you put too much on, soak it up with a torn-off bit of kitchen paper. I found it best to leave it to set for an hour – longer for unsupported joints that had to take some weight. The glue will also darken the card, so don’t splash it about (I managed to glue my hand to the couch!). The green card began life as a pentagon, which I cut into around each vertex. The remaining bits were scored and bent into “z” shapes (these became the clamps). The pentagonal pyramid comes from our friend the deltahedron. 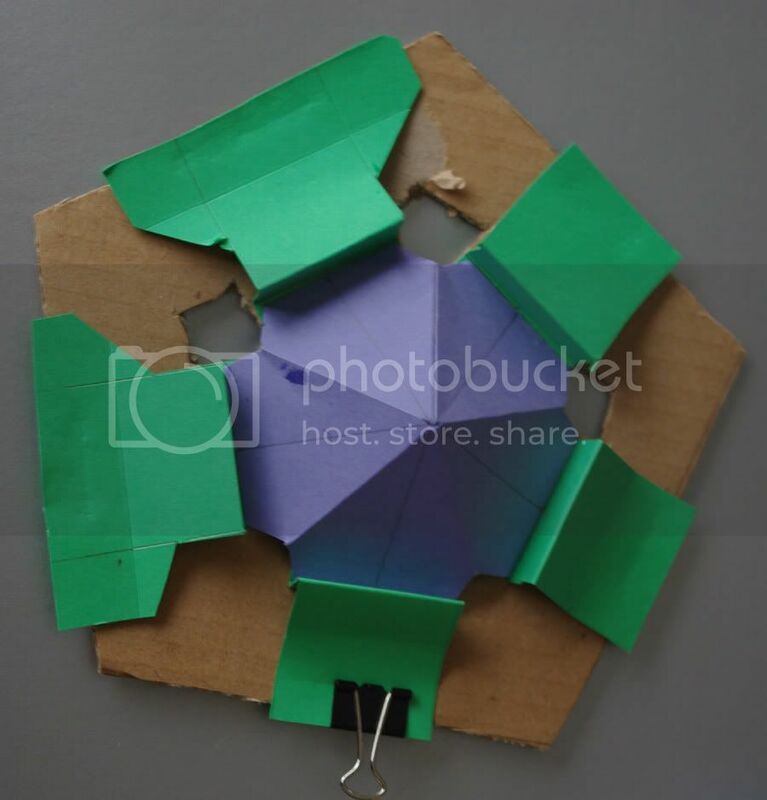 The green tabs can be moved in and out so that it is easy to manipulate the polyhedron. So we have three layers: fat, brown card, green card and finally, rigid blue card. The holes in the brown card are there to prevent the cells from sticking to the cradle. No magnets, this time, just blu-tac to hold the cells in place. To be honest, I think that the MW approach would probably work providing that your measurements are precise and you use the right glue from the start, but I just couldn’t get it to work for me. Whatever cradle design you adopt, be sure to draw lines that dissect each equilateral triangle. This will help you to align the cells, as the obtuse-angled vertex should sit on the line. This technique will also allow you to align the sides of your cradle accurately – this is not as easy as it looks once the vertices have been cut away. I can’t believe I went to these lengths. I considered fishing line too, but I didn't try it. Instead, I used some linen repair thread, because I thought it would absorb the glue better. It worked really well in experiments, and held the pieces together rigidly, but it was very fiddly when it came to stringing more than two cells together. I found that it tended to slip out of the point of the vertex (which is very sharp). If you can manage to keep it in place, I'm sure that it will much improve the stregth of the joints.